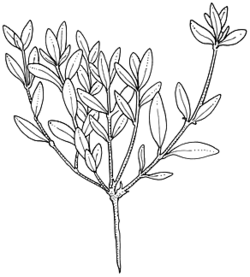 Description: Herb or procumbent undershrub to c. 15 cm high, dioecious; branches with 2 lateral longitudinal ridges. Leaves with lamina narrow-elliptic to narrow-obovate, or oblong, 6–12 mm long, 3–6 mm wide; apex obtuse to acute; base cuneate to attenuate, somewhat decurrent; margins slightly revolute; lower surface smooth, not papillose; petiole 1–3 mm long. Inflorescence 1-flowered; flowers unisexual. Calyx 3–5 mm long; lobes narrow-ovate. Corolla 4–8 mm long, white; tube 3–4.8 mm long, longer than lobes; lobes ovate to elliptic, obtuse; outer surface glabrous; inner surface sparsely hairy throughout tube and basal half of lobes, hairs thick and crinkly. Stamens inserted in mouth. Distribution and occurrence: Grows in dry sclerophyll forest often on sandstone, scattered.